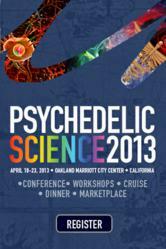 Registration Is Now Open for Psychedelic Science 2013 in Oakland, Calif., April 18-22, 2013. Psychedelic Science 2013 will present the latest research on the potential benefits as well as the risks of these fascinating compounds. Psychedelic Science 2013 presents the world’s leading psychedelic research in a three-track conference and multiple workshops over five days. More than 65 speakers from at least 11 countries will share their latest research. The three concurrent tracks will explore results and findings from (1) Clinical Research, (2) Interdisciplinary Research, and (3) Ayahuasca Research. Over the past decade, psychedelic research has been experiencing an international renaissance. Substances such as LSD, psilocybin, MDMA, ayahuasca, and ibogaine are being explored for their potential to calm end-of life anxiety, reduce the effects of post-traumatic stress disorder (PTSD) and depression, and help end addictions to alcohol and opiates. Psychedelic Science 2013 will present the latest research on the potential benefits as well as the risks of these fascinating compounds. Psychedelic Science 2013 is the second such conference held in the United States. The first conference in San Jose, Calif. in April 2010 sold out, drawing over 1,000 attendees and receiving international media attention. Conference presenters come from the world’s leading universities—including Johns Hopkins, University of California Los Angeles, University of California San Francisco, Purdue University, University of São Paulo (Brazil), Pompeu Fabra University (Barcelona), Heidelberg University (Germany) Hannover Medical School (Germany), University of Zürich (Switzerland), University of British Colombia (Canada), University of Toronto (Canada), and many others—as well as from leading independent research institutes. Many researchers are accomplished authors, publishers, and speakers. In addition to the conference and workshops, Psychedelic Science 2013 will provide ample opportunities to connect with others interested in this promising medical and scientific field. Friday night attendees can enjoy a 3-hour Sunset Cruise and informal dinner on the San Francisco Bay, with an option to disembark in San Francisco to attend Alex and Allyson Grey’s “Bicycle Day” event. Saturday night attendees may attend a formal evening dinner. The Marketplace of Goods and Ideas will be free and open to the public exhibit hall for shopping, scientific poster presentations, book signings, and impromptu gatherings. Continuing Education credits are available for psychologists, medical doctors, therapists, and other health professionals. Psychedelic Science 2013 is presented by the Multidisciplinary Association for Psychedelic Studies (MAPS), Heffter Research Institute, Beckley Foundation, and the Council on Spiritual Practices. For more information and to register, visit psychedelicscience.org.